The image is a staple of the Christmas season: A worker for the Salvation Army stands outside a busy store, ringing a hell and asking shoppers to fulfill the giving spirit of the holiday by dropping a few coins in the pot. For decades, non-profit organizations providing aid to the poor, education and the arts relied on this country's strong tradition of altruism. 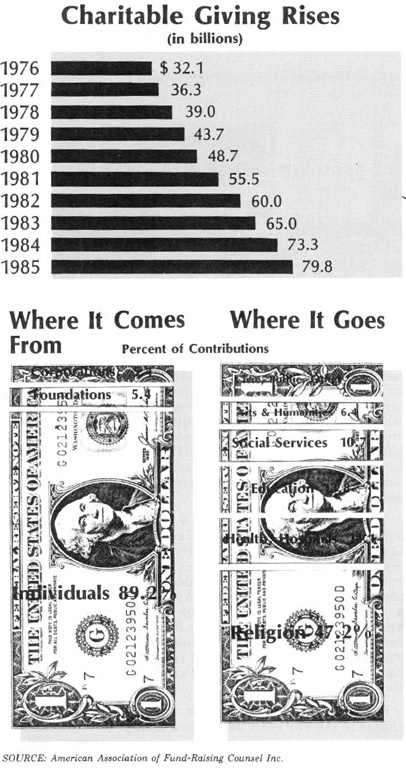 Americans are among the most generous people in the world, giving $79.8 billion to philanthropic causes in 1985. Aided by growing support from the federal government, charities—like the bell ringer—were able to raise money simply by asking people. Today, however, charity faces a new reality. The old-fashioned approaches to raising money are being replaced by sophisticated new methods that make charities much more like for-profit businesses. A rock star—his face beamed by satellite to millions of people around the world—intersperses music with pleas to help starving children in Africa. A country singer stages a concert to help farmers. A college markets a word-processing program for computers that brings in millions of dollars, while a community mental-health group raises its fees for counseling. A worthy cause lends its image and reputation to a private company, helping it sell beer or credit cards in return for a share of the profits.